This is the second in a two-part series in conjunction with D Magazine’s urbanism special issue that looks at how thinking around urban planning has created the city Dallas is today. The first can be found here. By the mid-twentieth century, observers of the rapid changes that were unfolding in American cities began to recognize that the places that were being created did not reflect the ideals promised by the authors of the City Beautiful, Garden City, and Radiant City visions. For all their virtues and flaws, these imaginations of city life were supposed to enrich the quality of life of its inhabitants, allow greater access to nature and leisure, and introduce a higher standard of aesthetic pleasure in urban form. But many 20th century “urban renewal” programs only created urban blight, transforming cities that were once full of life into empty, dull, and dangerous places. One of the most outspoken critics of “urban renewal” was Jane Jacobs, a writer and activist who, after helping defeat a planned highway project that would have demolished her neighborhood in New York’s West Village, published a landmark treatise on city life called The Death and Life of Great American Cities (1961). Drawing on close observations on how life in her neighborhood functioned, Jacobs argued that cities thrived when their communities were home to many uses that were shared by people who sought in them a variety of opportunities and services. Jacobs embraced the messy intermingling of people, places, and economic functions that modern planners had spent a half-century attempting to root-out. Crucially, Jacobs understood that the mid-century deterioration of cities was no accident. Jacobs was not alone. Other urban observers, such as writer William Whyte and planner Kevin Lynch, began conducting careful observations of day-to-day life in vibrant city neighborhoods and came to many of the same conclusions. But by the time that these critics began sounding the alarm, this new approach to city planning had already been enshrined in many codes, policies, governmental programs, and the attitudes and assumptions of city, regional, and federal planners. In the 1970s and 1980s, riots, fires, surmounting crime, deepening segregation, expanding poverty, and general urban dereliction came to define the very loci of supposed “urban renewal” projects. Planners and bureaucrats saw this not as a failure of policy, but as its insufficient implementation. Sun Belt cities proved effective at hiding the costs of the success of “unurban urbanization,” and in the 1970s and 1980s, Dallas emerged as a model of the kind of economic success government-subsidized suburban sprawl could generate. However, Dallas’ model of growth created its own problems. While residents migrated into the region’s northern suburbs in pursuit of bigger homes and better educational opportunities, those who remained behind struggled with degrading schools, rising crime, and entrenching poverty. By the late 20th century, this pattern of expiration and neglect began to migrate outside of Dallas and into its inner-ring suburbs. The communities that were the first beneficiaries of decentralization were eclipsed by newer and more attractive suburbs. This cycle is one of the peculiar, paradoxical characteristics of the decentralized city. On the one hand, the decentralized city seems to treat neighborhoods like the consumer economy treats commodified goods. Neighborhoods have a shelf-life. As they age and their initial appeal fades, they are discarded in favor of a newer “neighborhood-products.” Unlike neighborhoods in centralized cities, which become more desirable as they mature and stabilize over time, in the decentralized city, older neighborhoods are discarded as a kind of urban consumer waste. 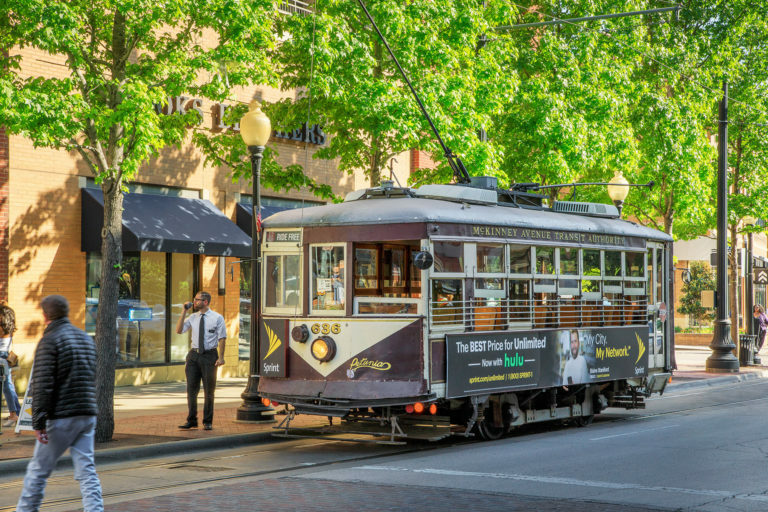 Wheel Cool: The Uptown trolley was resurrected as a cute diversion for tourists but has now become a legitimate transportation option for residents who commute to downtown. But in other ways, the decentralized city doesn’t appear to follow the logic of a consumer market at all. As the tremendous rebound of urban real estate values in walkable cities like New York and San Francisco attest, the kinds of neighborhoods Jacobs, Whyte, Lynch, and others championed are highly desirable to many people. But if there is consumer demand for these kinds of communities, why haven’t developers met that demand by building new urban neighborhoods? Over the past two decades in Dallas-Fort Worth, some developers have attempted to build more walkable, urban neighborhoods. But too often, developers seeking to build new urban neighborhoods are met with the complicated tangle of codes, policies, and financial regulations developed in the 20th century to support the growth of sprawl. These bureaucratic and political rules and assumptions have been sublimated into the inner-logic and administration of the decentralized city, making the production of a single, monolithic urban form the normative operative procedure of regional governance. Put simply, myriad administrative obstacles make it all but impossible to build good urban neighborhoods in Dallas. But most of us know what it feels like to be in these cities because they are the places we seek out in our travels. They are cities in which streets are filled with people; cities that can be explored and discovered by foot; cities that foster interaction, not separation; variation, not monotony; human connection and community, not dissociation and isolation. After witnessing the urban devastation of the latter half of the 20th century, architects, planners, politicians, and municipal bureaucrats revisited the writings of Jacobs and the other critics of urban renewal and began to rethink assumptions about what successful urban neighborhoods look like. At the same time, as the century drew to a close, new images of American life began reshaping public opinion, in part through television shows like Seinfeld and Friends. The allure of the suburban utopia was replaced in the popular imagination with idealized feelings of possibility and energy conveyed by images of life in urban neighborhoods. And the cities that still possessed these kinds of older, messier, multi-functional, pedestrian-driven, human scaled places began to thrive again. Twentieth-century urban renewal had left many cities with few well-functioning urban neighborhoods, and in regions like Dallas-Fort Worth, hardly any at all. A rise in demand, coupled with limited supply, drove the real estate values of attractive urban neighborhoods through the roof. Along with increased financial speculation, the hyper-financialization of the real estate, and other pressures of an increasingly globalized economy, urban neighborhoods in cities like New York and San Francisco became economically unattainable for all but a few. Urban life, once associated with crime, drugs, and dereliction, emerged as synonymous with economic elitism. Gentrification and the economically driven displacement of residents from established neighborhoods proved nearly as disruptive and destructive as urban renewal. But just as the suburban sprawl is not a deterministic outcome of the invention of the automobile, gentrification is not a necessary result of the desirability of urban neighborhoods. Rather, it is partly a symptom of a political and economic system that has largely eliminated choice from the neighborhood market. Even though studies have shown that upwards of 60 percent of Americans would like to live in neighborhoods that are walkable, where basic services are accessible without the use of a car, and which foster a greater sense of community, only a small percentage of the built environment in the United States provide this kind of urban experience. Planners and developers hoping to reintroduce desirable urban spaces found it easier to accomplish in some cities more than others. The Danish architect and urban designer Jan Gehl helped to radically transform Copenhagen into a hyper desirable bike-and-pedestrian-centric urban playland in a little over a decade by redesigning streets and public ways that supported pedestrian and bicycle use. In New York, projects like the renovation of Bryant Park demonstrated how applying Jacobs’ and Whyte’s principals of scale and dynamic, cross-pollinating human interactions could turn what was once a crime and drug ridden no man’s land into one of the most beloved and well-used parks in the country. But too often, planners seeking to return cities to human-oriented scale ran into opposition from entrenched bureaucrats, politicians, and stakeholders alike. The principles of the 20th century urban experiment had become established dogma, and many held tight to a belief that easily accessible free parking, fast-moving highways and streets, segregated commercial and residential districts, and limited density were essential ingredients to urban success. Zoning, building, traffic codes, and other policies restricted the kinds of building forms, densities, and streets designs developers and cities could provide. It became clear that, in order to change urban form, the rules of urban governance would have to be rewritten. One such effort came in 1993, when a handful of architects and planners came together to form the Congress for the New Urbanism, which made one of its central prerogatives to draft a new building code that would simply allow cities to create the kinds of urban places people wanted but cities no longer had. The “Smart Code,” as the Congress for the New Urbanism called, was not a set of aesthetic ideals. Instead, it attempted to distill Jacobs’ and Whyte’s observations about how cities functioned into the language of governmental code. 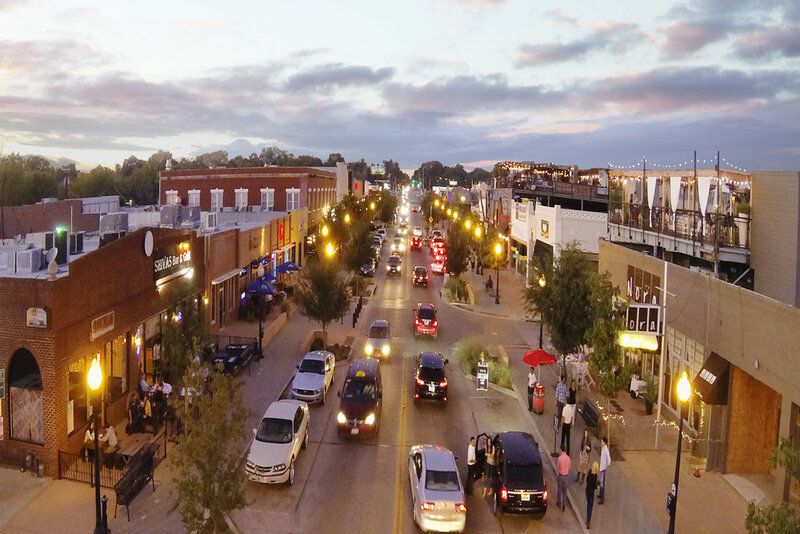 It emphasized attributes like “walkability,” defined as having access to shops, restaurants, workplaces, and services within a 10-minute stroll from one’s front door. Neighborhoods were to be connected by a clearly defined hierarchy of narrow streets, boulevards, and alleys, all accented with high-quality pedestrian amenities. As Jacobs argued, good streets incorporate a mix of uses and diversity of functions, with blocks that contained shops, offices, apartment, and homes, and districts that included housing suitable for a variety of ages, income levels, cultures, and races. Continue carousing on Lower Greenville. Photo by Scott Womack. Quality architecture is important to the success of urban neighborhoods but it shouldn’t be employed to justify the creation of largescale, monolithic superblock developments or uniform, monofunctional districts. Rather, buildings should offer a range of styles and prices, be situated in close proximity to each other, and older structures should be preserved alongside more contemporary forms. Density is vital to allow for walkability and economic vitality, but the planning of neighborhoods, districts, and towns should also carefully consider their overall structure. Highest densities are encouraged toward the center, with the entire district defined by an overall range of densities, ample public space, and discernable edges. These principles of urban neighborhoods are not necessarily reserved for urban centers alone. Heavy government subsidization of sprawling super regions has created metropolitan areas that are expensive to maintain, inefficiently distribute economic opportunity, rely exclusively on automotive transportation, and contribute to environmental degradation and pollution. One way to overcome some of these shortcomings is to plan a greater diversity of mixed-density, mixed-use neighborhoods throughout the sprawl of massive super regions—a “multi-nodal” metropolitan region, a region defined by an interconnected network of dense urban areas. City centers like Dallas, as well as many suburban towns and cities, could take advantage of the desirability and enhancing qualities of urban neighborhoods by reconfiguring their layout around clusters of urbanity that sit amid the wider expanse of suburb and exurban communities. It is a vision of a region that would develop into a multi-nodal network of urban, suburban, and ‘edge’ communities, a decentralized city that is not defined and determined by a monolithic sprawl but is home to a multiplicity of smaller urban centers, each of which enhanced by the possibilities of strengthened community, stabilized economic value, and enhanced environmental sustainability. We have already begun to see what these new successful cities will look like: they are the places that reconnect with the fundamental qualities and efficiencies that are intrinsic to dense urban communities. For 5,000 years, limitations in transportation and communication retrained the geographical shape and scope of cities. Today, technology has advanced to the point where human societies and economies can transcend most geographical limitations. The railroad and car began this process by accelerating mobility. Continuing advancements in communication networks, automated transport, and mediated and artificial intelligence will only expand the capacity to imagine new forms of urbanized society. In light of this, the urban experiments – and failures – of 20th century should provide a warning. The best cities are not designed by prioritizing the possibilities of technology, but rather by responding to human needs. Today, urban planners and policy shapers who are inspired by Jacobs and her ilk are attempting to accomplish something that has never been attempted in human history: they are trying to shape urban environments that forgo the possibilities of technological potential in favor of focusing on more humanistic design considerations. Here too the urban experiments of the 20th century offer a lesson. The rapid upheaval in the geography of urban space was brought about by a wholesale rearranging of urban polices. The reversal of this system of development could be accomplished by a similar broad-based application of new ideas and principles.